Are you familiar with seasonal allergies? If you live in Austin,Texas, you probably know more about periodic wheezing, sneezing, and sniffling than just about anyone! It’s not all doom and gloom, though. According to the AAFA (Asthma and Allergy Foundation of America) 2016 fall Allergy Capital list, Austin is ranked at 46th place compared to 35th place in 2015(1). It appears things seem to be improving for us here in the live music capital of the world. But while the rest of the nation generally only has two pollen seasons (fall and spring), Austin is unique in that we have three distinct pollen seasons, plus an intense winter pollen season. That is why some people call Austin the Allergy Capital of the World! Mountain cedar pollen season extends from December to March, with peak levels usually hitting in January. Cedar pollen counts in Central Texas are among the highest pollen counts of any plant anywhere in the world. Cedar allergy, commonly referred to as "cedar fever," can be intense and debilitating. Cedar fever is a seasonal illness that affects people during pollination of the mountain cedar tree(3). As you may know firsthand, people experience severe symptoms when afflicted by cedar fever and can find that their daily activities are greatly impacted while it runs its course (2). Western medicine relies on two forms of allergy treatment: medication and immunotherapy. Decongestants and antihistamines are the most common allergy medications, and they can help to reduce a stuffy nose, runny nose, sneezing, and itching. Corticosteroids are generally effective in treating inflammation in the nose in the form of nasal spray. Immunotherapy is a preventive strategy designed to ward off allergic reactions to substances such as pollens, etc. This involves giving gradually increasing doses of the allergen or substance to which the person is allergic. The incremental increases of the allergen cause the immune system to become less sensitive to the substance, which ultimately reduces the symptoms of the allergy. Traditional Chinese Medicine (TCM) relies on a more holistic approach to allergy relief. By virtue of satisfactory clinical results due to a combination of acupuncture, moxibustion and Chinese herbs, more and more people are realizing that seasonal suffering caused by allergens can be avoided without exclusively relying on invasive Western medical treatments. But, you might be asking, how does this work? According to TCM, people who suffer from allergies experience what we term a wind invasion to the body combined with defensive Qi (vital energy) weakness of the body itself. TCM treatments are designed to treat both the root of the disease as well as the symptoms that you are experiencing. Acupuncture can treat allergies by controlling the body’s inflammatory reactions to allergens, and specific points that your practitioner selects, such as acu-points on face and foot, can relieve the nasal and facial symptoms by stimulating the far ends of the channels, or meridians, where Qi flows. Specific herbs can also help to reduce the inflammatory reaction and desensitize the body to allergens. Treasures from the Chinese herbal tradition, such as Huangqi (astragalus) can modulate immunity, while still others, like Cangerzi (fructus xanthil) and Juhua (Chrysanthemum flower) can lower histamine production to relieve the nasal and eye symptoms. Regular moxibustion, or heated herbal therapy, can boost the body’s immune system to prevent allergy symptoms in the first place. Generally, people with allergies would be wise to begin TCM treatment one to two months before the allergy season, in order to allow the body to build up the necessary immunities. However, during the allergy season itself, immediate treatment can also provide great relief. Your best bet is to talk to your practitioner and find a strategy that best suits you, especially if you have a chronic allergic response that recurs each year. Your at-home activities can also make a difference in the allergy symptoms you experience. Do you take vitamins? Study results demonstrate that Vitamin D supplements can alleviate seasonal allergy symptoms and treat chronic hives. In addition, Vitamin C is a well-known immune antioxidant that lowers histamine levels to prevent the onset of allergies. Are you mindful of your diet? Dairy products, sugar, and wheat are all common contributors to allergy symptoms, so limiting your intake of these foods may help reduce your symptoms. TCM highly values the proactive nurturing of one’s health, and there are several modalities that can help. Striving for balance in your daily life and regular self-care make a positive difference in your Qi and promote overall wellbeing. Mind-body exercises such as qi gong can teach you to cultivate your body’s natural healing energy as well as reduce stress. Reasonable amounts of work followed by rest, a plan for managing stress, and proper diet are also important for preventing allergy symptoms. Acupuncture reduces stress, boosts mood, and helps you sleep better. By avoiding overwork and receiving sufficient hours of sleep each night, the body’s vital energy remains strong and less susceptible to allergens If you take time to enjoy yourself and maintain a happy mood, then you are doing a wonderful job supporting your health during the allergy season! 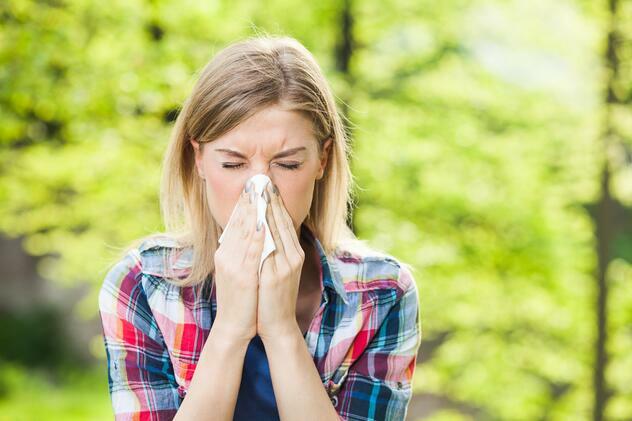 Request an appointment at AOMA Acupuncture Clinics to get started on your allergy relief!